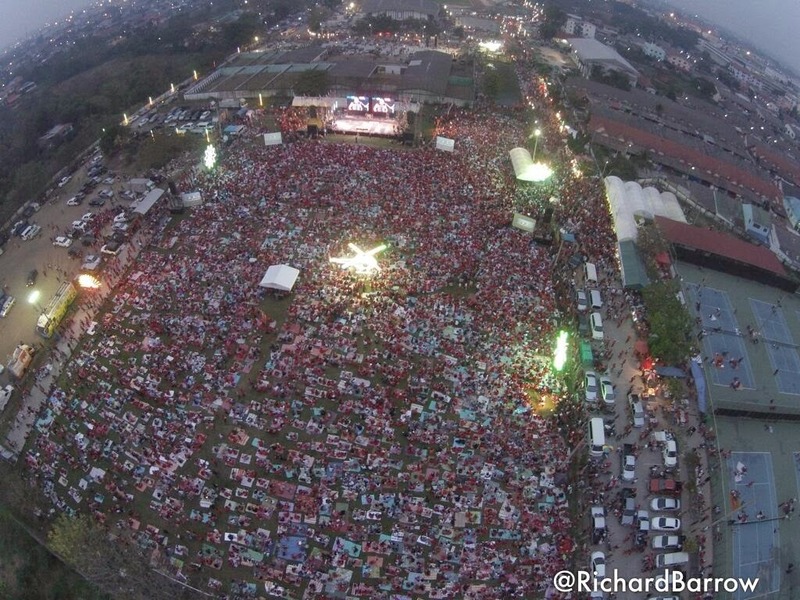 Only a few thousand pro-regime “red shirts” gathered in the city of Ayutthaya, a few hours north of Bangkok, after rally organizers promised “200,000” would attend. The move exposed what many have suspected, and a growing body of evidence has proven, that the regime’s support base has effectively disappeared. UDD chairwoman Tida Thawornseth announced Tuesday that supporters from across the country would travel to the rally site to show their support for democratic elections and the elected government. Yet, despite the nationwide call for supporters, even pro-regime observers, refusing to give an exact number claimed, “several thousand” attended, while others put the number at approximately 1,500. It appears that the rally never reached even 5,000, dwarfed by previous “red shirt” rallies held years ago at the height of their popularity, and utterly outmatched by the hundreds of thousands who took the streets in recent months in opposition to the regime and its “red shirt” mobs. In fact, the permanent occupation of Lumpini Park in downtown Bangkok sees larger crowds nightly than this single day, and clearly failed, publicity stunt attempted by the regime. 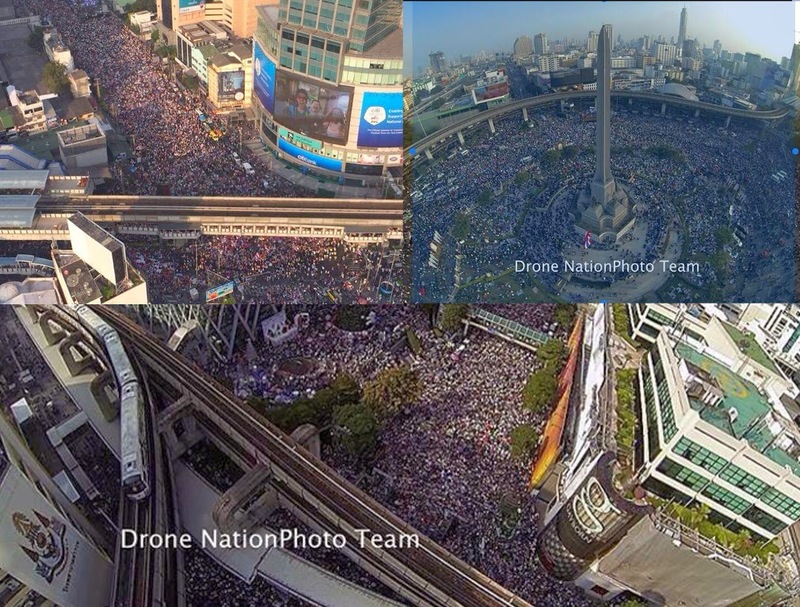 Image: On the top – only 3 of 7 major rally sites during the opening day of “Occupy Bangkok” in which a million people are believed to have taken to the streets throughout the entire day, and at any given time hundreds of thousands occupied the streets of Bangkok. On the bottom, the minuscule pro-regime rally held today in Ayutthaya, which includes, according to the regime itself, regime supporters from across the entire nation. Clearly, the regime has demonstrably depleted its support base. (click image to enlarge). The inability of the regime to muster a counter rally, even in the northern regions of Thailand where its support is supposedly strongest, is yet another indicator that it is a spent force. Sham elections held on February 2, 2014, were outright boycotted by over half of eligible voters. Of those that did vote, many chose to deface their ballots or check “no vote” in protest of the regime and the very process. More recently, and amid continued street protests, courts have continued to rule against the illegality of many of the regime’s policies, including a 2 trillion baht spending bill that involved voter fraud in the parliament and fears of corruption in the wake of the multi-billion baht, failed rice subsidy program that has imploded in dramatic form. Despite the growing opposition, and with even the regime’s traditional supporter, the nation’s impoverished rice farmers, turning against them, it continues to cling to power. Thaksin Shinawatra’s nepotist appointed sister, Yingluck Shinawatra serving as Prime Minster, pleaded for an explanation as to why Thais have grown to hate her family. This is a family that in 2003 saw to the death of some 3,000 innocent people in a so-called “War on Drugs” in which over half of those mass murdered were found to have no tie to the drug trade at all, and those that did, were not formally charged, tried, or sentenced by a judge, but instead extrajudicially executed in the streets. It has sown economic and political strife in the Kingdom for nearly a decade as it pandered to foreign interests in a series of attempted and successful free trade agreements, the use of Thai territory and troops to facilitate Western military aggression worldwide, and the piecemeal privatization and selling off of Thailand’s resources. It is clear as to why Thais have united against the Shianwatra’s and the political agenda they represent in growing numbers. The opposition continues to build not only its protest movement, but an array of alternatives and solutions to the many problems the regime has created and continues to subject the nation to. Eventually this “shadow government” will assume the role of fully administering the country while the current regime remains paralyzed, lashing out with greater desperation in all directions. The regime insists on clinging to power in the hope that it can intimidate and through force, eliminate its opponents. History dictates that this last chapter will not end well for the regime. It also dictates that all those who stubbornly stand with it will lose everything in the final days as it finally collapses and is swept from the pages of Thai history.